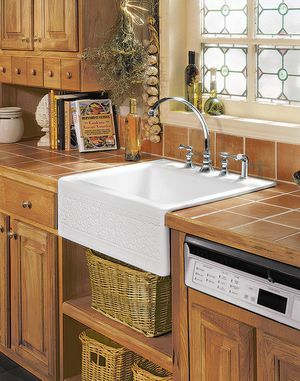 An apron-front or farmer’s-type sink adds visual impact to a small kitchen. Kohler. Make the most of a small kitchen. For starters, use lots of white colors, and install a good exhaust fan to ventilate the area. Q: Can you please give us your views on how to make the most of small kitchen spaces? A: My two basic suggestions for smaller kitchens are about the same as for smaller bathrooms: Use lots of white colors, and install a good exhaust fan to ventilate area. On top of my basic tips, here are three smaller-kitchen remodeling tips to keep in mind. Get as much light into the kitchen as possible. Long rectangular windows up high and close to the ceiling can make use of lower wall space and get natural light into the area. Skylights can also make up for limited availability to install large windows. Use shelves or shelving units in place of cabinets. Since shelves are open spaces, visually it can look like you have a little more room in the kitchen. The downside is that you just can’t throw a mess of stuff in a cabinet and close the door. Install a smaller-size single-bowl kitchen sink. No rule says you must have a large kitchen sink. Smaller single-bowl sinks work just fine and can save space. I recommend an apron-front or farmer’s-type sink that can give your small kitchen a big visual impact.